The Ark of the Covenant was a kind of chest, measuring two cubits and a half in length, a cubit and a half in breadth, and a cubit and a halfin height. Made of setim wood (an incorruptible acacia), it was overlaidwithin and without with the purest gold, and a golden crown or rim ran around it. At the four corners, very likely towards the upper part, four golden rings had been cast; through them passed two bars of setim wood overlaid with gold, to carry the Ark. These two bars were to remain always in the rings, even when the Ark had been placed in the temple of Solomon. The cover of the Ark, termed the"propitiatory" (the corresponding Hebrew means both "cover" and "that which makes propitious"), was likewise of the purest gold. Upon it had been placed two cherubim of beaten gold, looking towards each other, and spreading their wings so that both sides of the propitiatory were covered. It is worth noting that this is the only exception to the law forbiddingthe Israelites to make carved images, an exception so much the more harmless to the faith of the Israelites ina spiritual God because the Ark was regularly to be kept behind the veil of the sanctuary. In the Catholic Church, the Tabernacle is seen as the New Arch of the Covenant. The Tabernacle is a liturgical furnishing used to house the Eucharist outside of Mass. This provides a location where the Eucharist can be kept for the adoration of the faithful and for later use (e.g., distribution to the sick). It also helps prevent the profanation of the Eucharist. Thus the law requires, "The Tabernacle in which the Eucharist is regularly reserved is to be immovable, made of solid or opaque material, and locked so that the danger of profanation may be entirely avoided" (CIC 938 §3). The word tabernacle means "dwelling place." Any place someone dwells is a tabernacle. The term is also sometimesused for a temporary dwelling place. Thus the tent-like sanctuary that the Jews used before the Temple was built wascalled the Tabernacle, because God dwelt there. Similarly, for the feast of Sukkot the Hebrews erected temporary shelters to live in for the festival, which is often called "the feast of tabernacles" or "the feast of booths" as a result. The Tabernacle in Church is so named because it is a place where Christ dwells in the Eucharist. 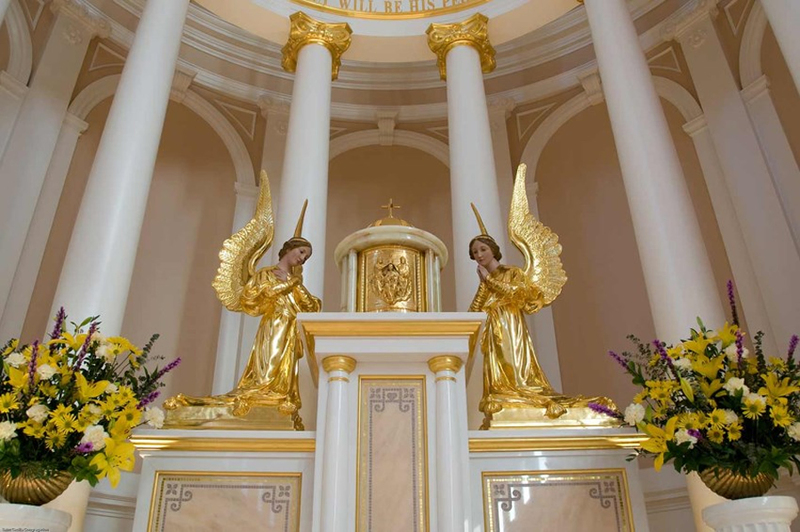 As the new Arch of the Covenant it is high appropriate to place kneeling angels on either side as was the case in the Jewish Temple with the Old Arch of the Covenant. Our Parish would like to purchase Adoring Angels to be placed along side our Tabernacle so that we may give Glory to our Lord. If you would like to donate to these angels, please contact our Parish Office.